Our Dixon House food court obsession continues with a visit to Oriental Dumpling King for Chinese hamburger, Chinese rissoles and dumplings. Braised pork (or lamb) burger $4.20. Spicy, cumin flavoured pork in a simple stodgey bun. The chilis aren't nearly as mean as they look. 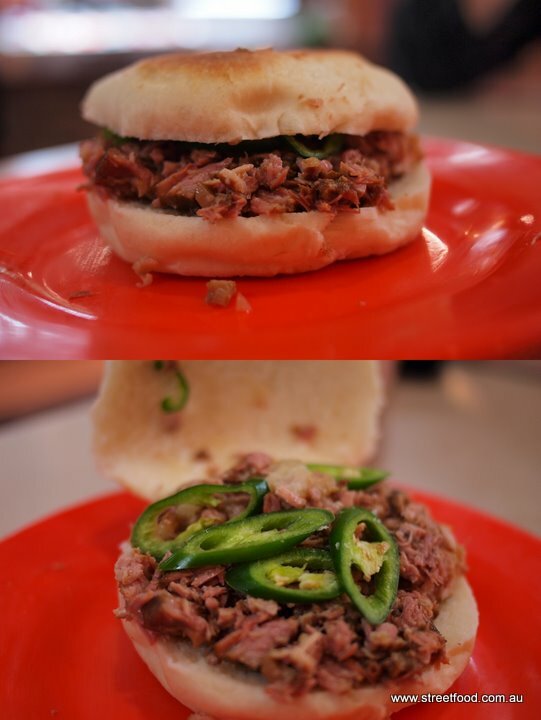 We have to get a 'Chinese hamburger' whenever we visit. Spicy pork balls - $7.80. Shawn can't resist anything resembling rissoles, he's a dag. These little beauties are served in a spicy sauce with two choices of veggies from the bainmarie of delights: we went seaweed and tofu. Dumpling soup - $8.80 with 12 dumplings - bargain! The dumplings are delicious, floating in a clear, lightly spiced broth with veggies. Bargain. Stir fried cumin lamb - $9. Lovely, lovely chunks of cumin lamb with grated potato, eggplant, fried potato and a generous serve of rice. The more we visit this place the more we like it. Handmade noodle soup with lamb - about $9.50. Nice lamby flavours in a thin homely broth. Handmade noodles with chili oil - about $9.50. This is a killer dish - thick chewy handmade noodles coated with chili oil, with a handful of veggies and roasted chilis to give it a twist. Fantastic. Pork with bamboo shoots - about $9.50. Braised pork burger - $4.50. Always a winner. Nice crispy bread with cumin flavoured pork in the middle. Those chilis have a bite. Stir fried Chinese veggies with mushrooms - about $8. Stir fried handmade noodles with cumin lamb - $9. The noodles really are handmade and have a lovely chew to them. We prefer a less saucy, more cumin-y version of this dish, but it's pretty good all the same. 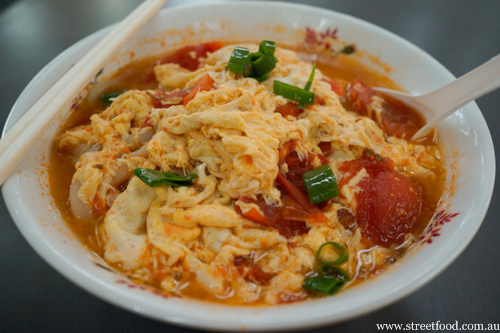 Oriental Dumpling King is a great place for a cheap, Northern Chinese fix. 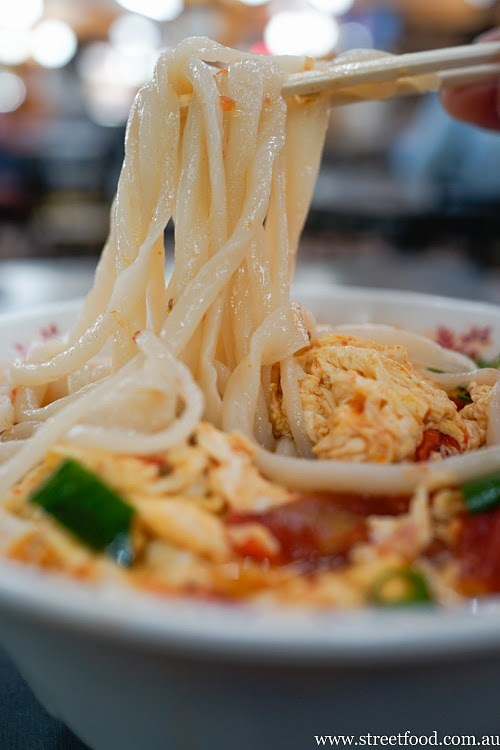 ...oh those noodles... these are handmade on the premises, thick with a perfect chew to them. This place is a gem. Oriental Dumpling King is in the Dixon House Food Court, corner of Dixon and Little Hay Streets in Chinatown. The burger looks delicious, must try that soon. I've had dumplings from here before but that soup looks delicious! Im going tomorrow for lunch! yum! oh wow this looks fabulous. You guys must have tried every place in this food court by now, surely? We have about four or five places left to go - so much food, so few eating opportunities. I love Northern Chinese food. Nice to see you have these specialty restaurants and don't clump all Chinese food together. You got to try the Stir Fryed Lamb with hand made noodles! I tried and the dumplings are the best and stir fried lamb cumin hand made noodles are superb.